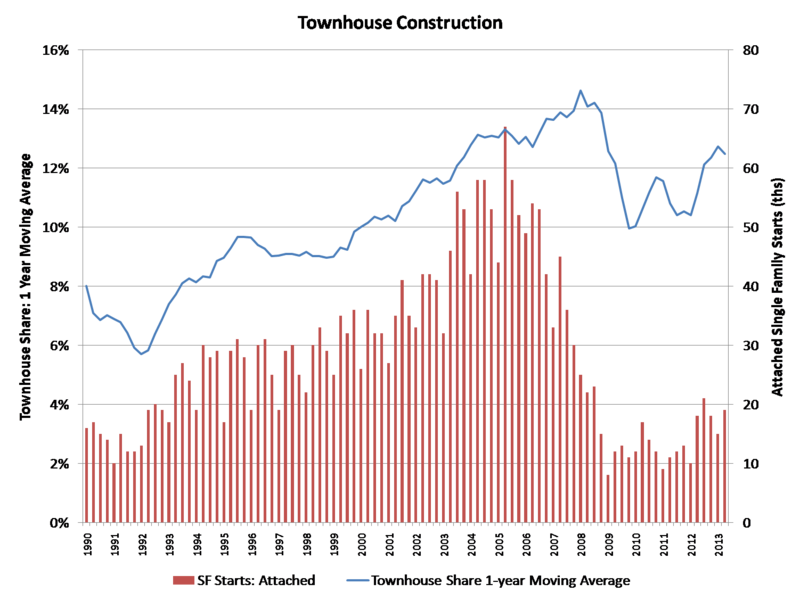 Total townhouse construction declined on a year-over-year basis during the first quarter of 2014. According to NAHB analysis of Census data of Starts and Completions by Purpose and Design, single-family attached starts totaled 13,000 for the quarter, compared to 15,000 during the first quarter of 2013. Over the last four quarters, townhouse construction starts totaled 66,000, down from the 72,000 total for the four quarters prior to this period. Using a one-year moving average, the market share of townhouses now stands at 10.7% of all single-family starts, effectively unchanged from 11.1% for the prior quarter. 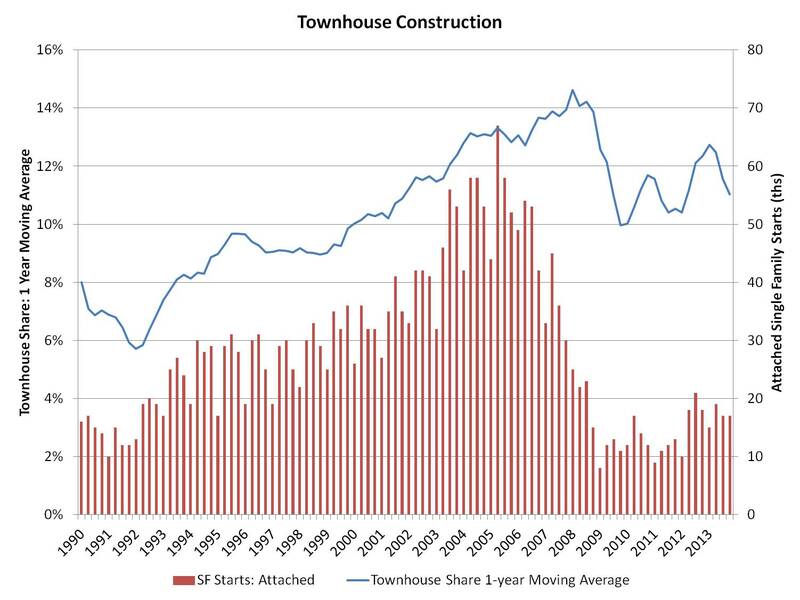 Despite the drop in market share during the Great Recession, I expect the share for townhouse construction to increase in coming years – with occasional ups and downs. For example, recent weakness in production may be associated with reduced levels of first-time homebuyers. 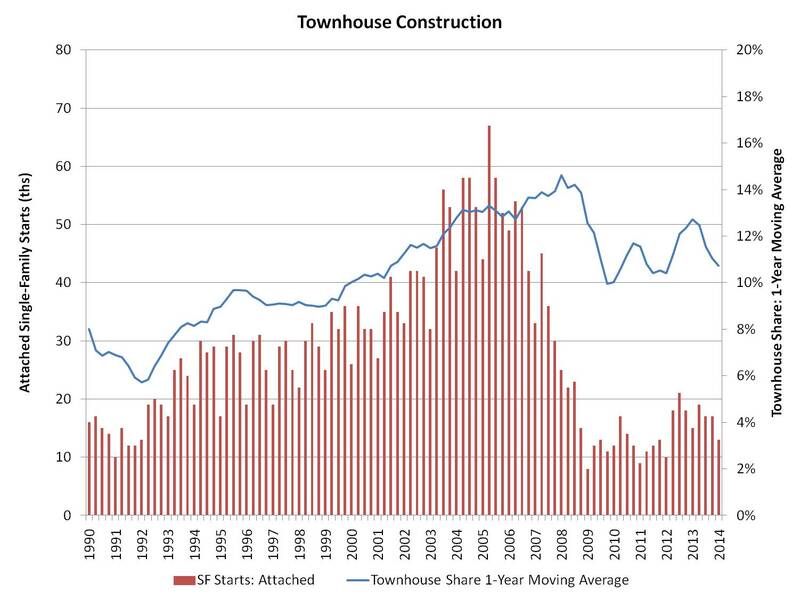 Total townhouse construction declined slightly on a year-over-year basis during the final quarter of 2013, per Census data of Starts and Completions by Purpose and Design. 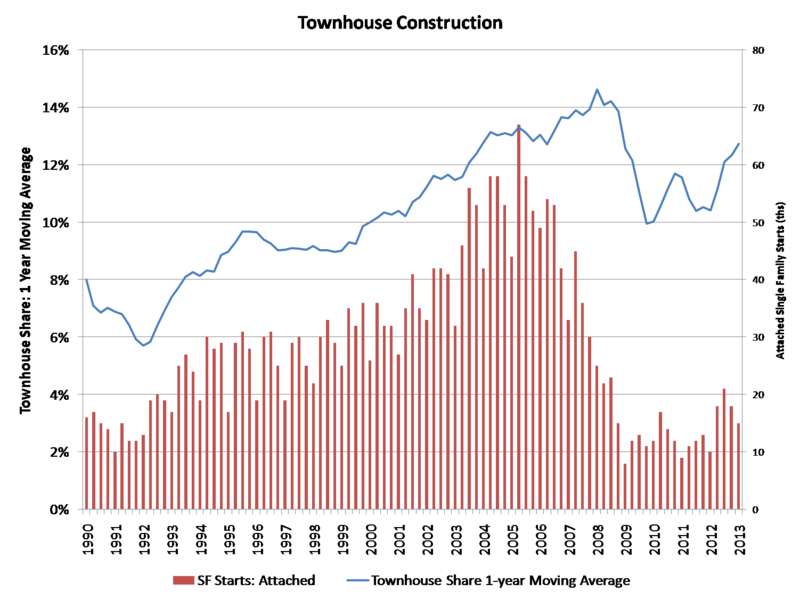 Single-family attached starts totaled 17,000 for the quarter, compared to 18,000 during the last quarter of 2012. Over the course of 2013, townhouse construction starts totaled 68,000, just slightly higher than the 67,000 total for 2012. Using a one-year moving average, the market share of townhouses now stands at 11% of all single-family starts, down from 11.6% for the prior quarter. The current market share is down significantly from the first quarter of 2013 (12.7%). The market share has dipped in recent quarters as the rest of the single-family market has expanded. 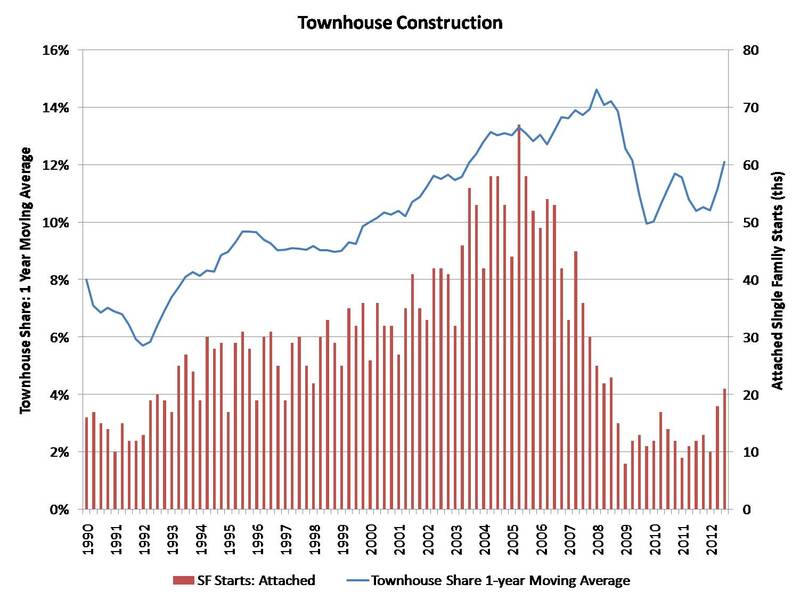 Despite the drop in market share during the Great Recession, I expect the share for townhouse construction to increase in coming years – with occasional ups and downs. For example, the market share may decline in the near term, given the ongoing rebound in the overall single-family construction sector and reduced levels of first-time homebuyers. For the third consecutive quarter, construction of attached single-family housing (townhouses) increased both in terms of total units and market share. 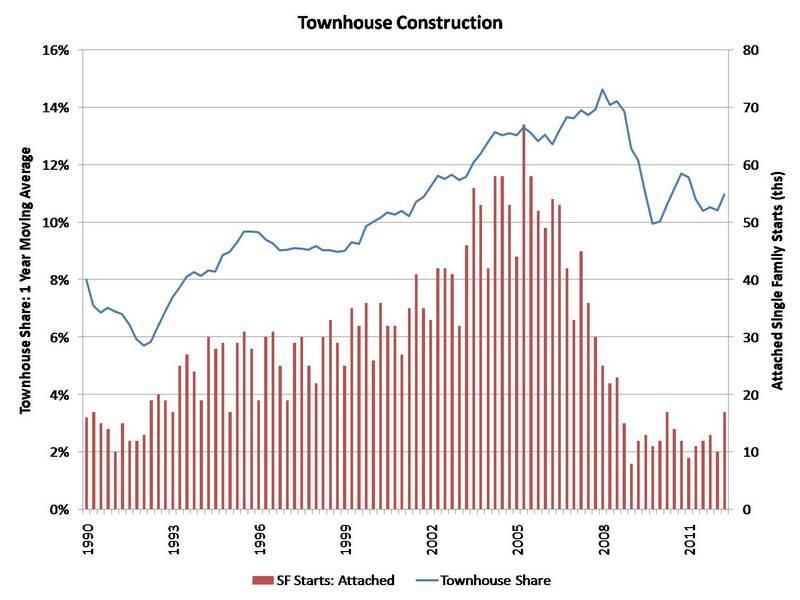 Per third quarter 2012 Census data of Starts and Completions by Purpose and Design, total townhouse construction has increased significantly in 2012, reaching a starts total and market share last seen in 2008. Quarterly construction of townhouses rose from 12,000 starts in the third quarter of 2011 to 21,000 starts during the same period of 2012. Using a one-year moving average, the market share of townhouses now stands at 12.1% of all single-family starts, up from 11.2% for the second quarter of 2012. 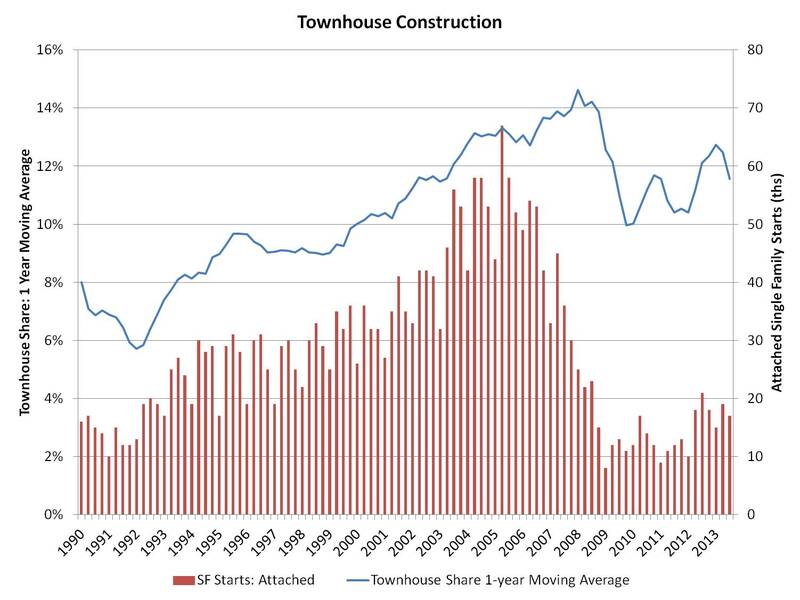 Despite the drop in market share during the Great Recession, I expect the share for townhouse construction to increase in coming years. The prospects for the townhouses are positive given large numbers of homebuyers looking for medium density residential neighborhoods, such as urban villages that offer walkable environments and other amenities.